Rules&Format - Welcome to our official website! Qualification – total of 8 games (4 games every squad). If a bowler is qualified in more than one category, the next bowler on the list in the category where his qualification is unused will qualify. If a local or overseas bowler did not make to the Top 8, his scores will automatically be carried to the ‘mixed bowlers’. 32 bowlers will be divided into 4 groups (W–X–Y-Z) and will be assigned in the following format. Please see table 1.0 below. Every group will play a Round Robin Match (7 Games). 1 Game per match in each group. Winner will receive 3 Points and Loser gets zero. For a tie, 1 ball shot till the tie is broken. Top 4 of each group shall advance to Step 2. Players not continuing to Step 2 will be ranked Pos 17-32 according to their positions in the standing of the Final Step 1. 16 players= 4 players (Group W) + 4 players (Group Z) + 4 players (Group Y) + 4 players (Group X). Will play total of 2 games in a match play starting from scratch base in the following format. Please see table 2.0 below. Top 8 will qualify for Step 3. Players not continuing for Step 3 will be ranked Pos 9-16. Will bowl total of 2 games in the following format - See table 2.0. Winners from each match (consisting of 4 Bowlers) will advance to Step 4. Losers will be ranked Pos 5-8 according to their positions in the standing of the final Step 3. 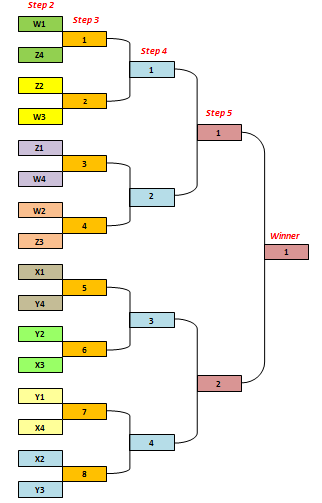 Winners from each match (consisting of 2 Bowlers) will advance to Step 5. The 2 losers will be ranked 3 – 4 according to their seeding. Will bowl total of 2 games. In case of a tie, a one ball roll off on a full set of pins will be played, repeated until the tie is broken. In case there’s a tie points in every group, a one ball roll off on a full set of pins will be played, repeated until the tie is broken. Maximum of 3 squads can be pre-booked via our official website.